Attend College / University in the US! Are you interested in college or university study in the United States? Do you need to improve your English? PIA can help you reach your goals. PIA’s Intensive English program helps students get ready to use English in an academic setting. 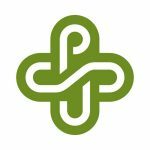 In fact, the University of Portland, Portland State University, and Clackamas Community College recognize completion of PIA’s Intensive English program as meeting English language proficiency requirements. That means that PIA graduates don’t need a TOEFL or IELTS score to apply for admission at these schools. * Applicants must meet all of the other application requirements of the college or university. PIA offers academic advising and application support. Contact us today about applying to one of our college or university partners! *See details about admission requirements and using PIA’s program as a TOEFL/IELTS waiver. PIA has a pathway from Intensive English to Warner Pacific University (WP). Students who complete all Level 5 courses of PIA’s Intensive English program can apply to WP without submitting a TOEFL or IELTS score. Level 5 meets WP’s language requirement for undergraduate and graduate programs. 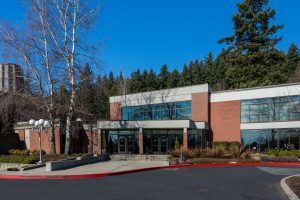 Warner Pacific University is a Christ-centered, urban, liberal arts university dedicated to providing students from diverse backgrounds an education that prepares them to engage actively in a constantly changing world. Undergraduates can choose from 25 majors and 29 minors, and three graduate degrees are available. Smaller class sizes provide students with a personalized, holistic education in a welcoming, safe environment. WP believes that a degree should be more than just a piece of paper. At Warner Pacific, students gain the confidence, knowledge, and professional network they need to make a difference in their families and communities. PIA has a pathway from Intensive English to Willamette University (WU). Students who complete all Level 5 courses of PIA’s Intensive English program can apply to WU without submitting a TOEFL or IELTS score. Level 5 meets WU’s language requirement for undergraduate and graduate programs. 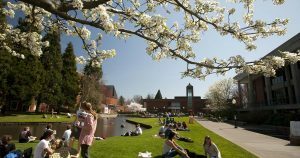 Willamette University is a nationally renowned private liberal arts university in Salem, Oregon. 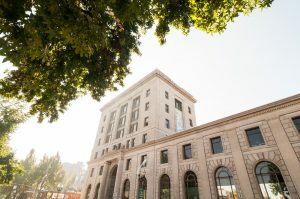 Founded in 1842, Willamette is the first university established in the western U.S. and has become a national leader in sustainability and civic engagement. 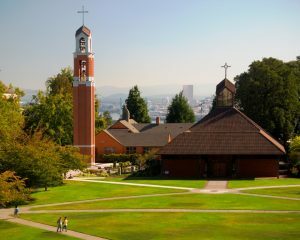 PIA has a pathway from Intensive English to the University of Portland (UP). Students who complete all Level 5 courses of PIA’s Intensive English program can apply to UP without submitting a TOEFL or IELTS score. Level 5 meets UP’s language requirement for undergraduate and graduate programs (except nursing). 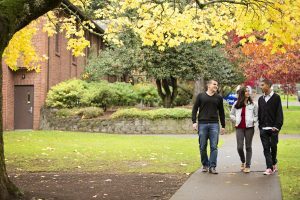 University of Portland prepares students for a successful and meaningful career in medicine, law, engineering, teaching, business, and more. UP graduates are creative, effective leaders and ethical decision makers sought by the nation’s top companies and graduate schools. 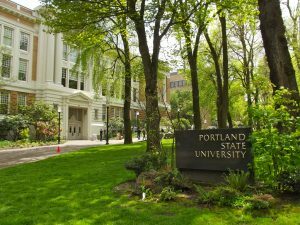 PIA has a path way from Intensive English to Portland State University (PSU). Students who complete all Level 5 courses of PIA’s Intensive English program (with an average of 83% or higher) can apply to PSU without submitting a TOEFL or IELTS score. Level 5 meets PSU’s language requirement for undergraduate programs. PIA has a pathway from Intensive English to Pacific Northwest College of Art (PNCA). Students who complete all Level 5 courses of PIA’s Intensive English program can apply to PNCA without submitting a TOEFL or IELTS score. Level 5 meets PNCA’s language requirement for undergraduate and graduate programs. PNCA is the only art and design college located in one of the most progressive cities in the United States. For all of its one hundred-plus years, PNCA has nurtured the talent in its students for radically reimagining everything, transforming the lives of our students and everyone they touch. Our studios and galleries continue to give rise to a vibrant community of innovators and culture-makers who shape the cultural landscape. 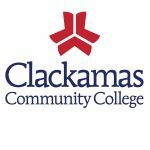 PIA has a pathway from Intensive English to Clackamas Community College (CCC). Students who complete all Level 5 courses of PIA’s Intensive English program can apply to CCC without submitting a TOEFL or IELTS score. Level 5 meets CCC’s language requirement. 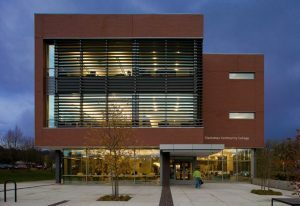 Clackamas Community College offers a variety of two-year degree programs and certificates. In addition, students who want to earn a four-year degree can start at CCC and easily transfer to a four-year university.